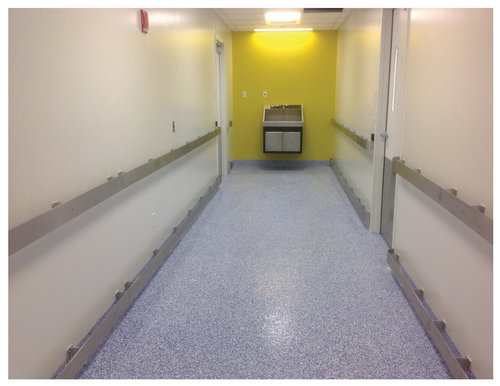 A new floor coating recommended for commercial environments such as kitchens and medical facilities features a rapid cure time and is low odor, according to the manufacturer. Series 256 ExcellaThane, the newest addition to Tnemec’s StrataShield line, is touted for a short return-to-service time: three hours for light traffic and six hours for full service in ideal temperature and humidity conditions, according to the company. Series 256 is a 100 percent solids, modified aliphatic polyaspartic, a formulation that Tnemec says cuts down on the odor that is sometimes characteristic of other high-performance floor coatings. It is also low in VOCs (11 grams/liter unthinned; 56 grams/liter thinned 5 percent). These characteristics, the company notes, make it a viable choice for settings where a floor must be returned to service quickly, or is in close proximity to inhabited spaces. The coating can be used in more aggressive environments, the company says, including commercial kitchens and pharmaceutical facilities where the floor is subject to strong cleaning agents. The coating can be used in more aggressive environments, the company says, including commercial kitchens and pharmaceutical facilities where the floor is subject to strong cleaning agents. It protects against impact, abrasion and mild chemicals. Tnemec also touts the coating’s slip-resistance. Series 256 is a two-component product and comes as a clear coat. It can be tinted with a color pack in one of 16 StrataShield colors, and a limited number of custom colors as well, according to Tnemec.